An art exhibition, birthday party, tranquil walks along the River Spey and more distillery tours made for another day at the festival. But for Melita Kiely, the highlight had to be choosing a new distillery exclusive bottling. My morning started very differently to yesterday’s distillery tour, with an unplanned drive around the Speyside region, past Glenfarclas and over towards Ballindalloch, past rolling hills with melting snow tops and lush green forests (sometimes a wrong turn can be a blessing in disguise). I was on a leisurely schedule for the first part of the day, and made my first stop in Aberlour to pop into a whisky and craft exhibition in the Still Life Gallery that I’d heard about. The two main artists were Matthew O’Connor, who’d created a selection of still house pieces using oil pastels – a quick initial glance fools you into thinking these are photographs of Glenfiddich and Cardhu stills and spirit safes, so expertly painted are they – and Alan Paterson, who’d produced a series of humorous cartoons and illustrations related to whisky and a detailed map of Speyside distilleries. After spending some time enjoying the art exhibition, I decided to wander around on foot before my next tour at 1pm. 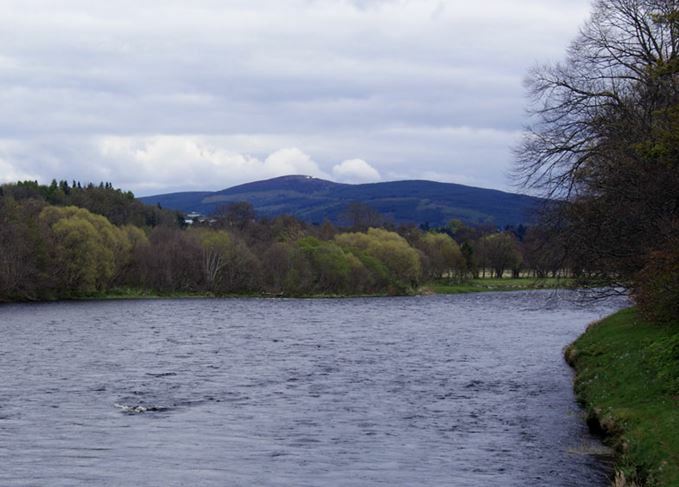 Just round the corner from the gallery sits Aberlour distillery, opposite the eerily beautiful Commonwealth War Graves cemetery – where the founder of Aberlour distillery, James Fleming, is buried – and a bridge that will lead you to the tranquillity of the River Spey. Speyside is a world away from the bustling, smog-laden streets of London that I currently call home, and taking a morning to breathe in the fresh air, evergreen surroundings and the quiet of the riverbanks was a true moment of bliss. As tempting as it is to jam-pack your schedule with tours and tastings, I'd highly recommend future festival goers to allocate some time to exploring the outdoors. Fill up a hip flask and get off the beaten track; take a walk through the woods, along the river, hike Ben Rinnes – I promise you won't regret it. I then headed over to Craigellachie distillery where I was greeted by Georgie Bell, global malts ambassador for Bacardi, and Kara Anderson, Bacardi home brand ambassador for malts. This is yet another distillery normally closed to the public but that offered tours especially for the Spirit of Speyside Whisky Festival. Bell led the tour to begin with, interchanging with Anderson from time to time, explaining how they create the ‘robust, muscular and oily’ whisky before unveiling a particularly special finale they had secretly planned. Master craftsman: Cooper Jim Reilly demonstrates how a barrel is constructed at Craigellachie distillery As our group was handed a glass of Craigellachie new make to contrast with a second dram of 17-year-old, the distillery’s master cooper, Jim Reilly, demonstrated how he and his team of coopers assemble barrels and rejuvenate tired casks, and explained how most of a whisky’s maturation happens in the first 18 months, and the majority of time after that period is more of a ‘mellowing process’. It was a fantastic insight into the inner workings of the distillery, from grain to barrel. Once the tour was over, I ventured over to Benromach distillery in Forres as I’d bagged myself a spot to help select the next distillery exclusive bottling. Stuart Urquhart, associate director of whisky supply and fourth generation Gordon & MacPhail, and Keith Cruickshank, Benromach distillery manager, were our personal tour guides for the afternoon. The tour started with a museum of old Benromach artefacts, including a disused Porteus mill, Porteus de-stoner and old washback from the original distillery. ‘My family has a disease called hoarding,’ joked Urquhart. Then it was onto the main event: the tasting. Six tasting glasses were filled with six different samples of Benromach, all of which could happily make this year’s distillery exclusive, said Urquhart and Cruickshank. We deliberated back and forth between our favourites for quite some time, before taking a break to explore the warehouses while we mulled over our final decisions. Unlike several other Speyside distilleries, being on the outskirts of the region means Benromach has the space to have its warehouses on site, and recently acquired 14 acres of land to expand its warehouses by 2019. But time was ticking and the distillery needed a decision. Torn between two utterly delicious expressions, the next Benromach distillery cask will be a 2010 single malt aged in a first-fill Sherry cask, bottled at cask strength 62.4% abv. The nose on this whisky was outstanding – thick and rich with butterscotch, sticky fudge, caramel ice cream and some spice. Youthful elegance: A seven-year-old single cask will become Benromach’s next distillery bottling​ It was a shame to call time on the tasting as it was a remarkable experience to be part of deciding such an important bottling for the distillery. But as the evening drew in, it was time for my final stop of the day – a birthday party at Glen Moray distillery to celebrate its 120th birthday. As the guests rolled in, a barbecue feast awaited, drams were drunk, music played and then it was time for the party games. First up a classic – pass the parcel – with each layer revealing a different fancy dress item to be worn throughout the rest of the night, from pink wigs and fairy wings, to tutus and weird and wacky headbands. This was followed by hula-hooping competitions, a dance-off and a giant game of Twister. No birthday party is complete without jelly and ice cream and as guests tucked in, distillery workers brought out a truly enormous birthday cake with so many sparklers and candles it’s a surprise it didn’t catch alight. Once the cake was dished out, and congratulatory speeches were made, distillery manager Graham Coull – who was this week named the festival’s ambassador of the year – took to the floor, gold, glittery pom-poms in hand, as the band struck up a cover of The Proclaimers’ I’m Gonna Be (500 Miles), and the crowds sang along. Celebrations carried on late into the night as guests ate, drank, danced and got to know other Spirit of Speyside visitors at their tables. People often hark on about how whisky brings people together, and last night’s festival party showed exactly how it does in the best way possible. The Spirit of Speyside Whisky Festival got off to a roaring start, with not a snowflake in sight. Dave Broom looks back on this year’s festival, at the friendship, whisky and lessons learnt.